Demanding to find the lost fishermen in Ockhi cyclone, thousands of women in Nagapattinam have stepped down into the sea yesterday. In some places, fishermen are protesting by tying their eyes in black cloth. So far 82 fishermen were found dead in 8 villages in Kanyakumari. 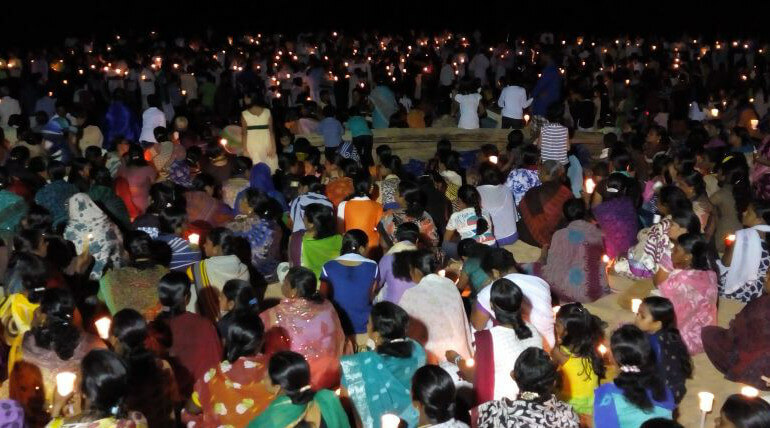 Poonthurai fishermen community people have protested candle light rally yesterday night seeking state government to find their beloved family members with rapid action. Several protests are being carried out in various places in the southern districts of Tamil Nadu. Huge rally of nearly 5000 people from 40 villages are rallying. About 500 people have surrounded collector office seeking rapid action to find lost fishermen. As per some reports, 570+ fishermen are still missing and two bodies washed ashore in Kerala. Actors Aari and GV Prakash visited Kanyakumari today and supported fishermen. They have joined protest and also provided relief materials for the affected people. People demand to take quick steps to find the lost ones, they also seek Rs 25 lakh to each fisherman family who died and also government job for any person in their family.